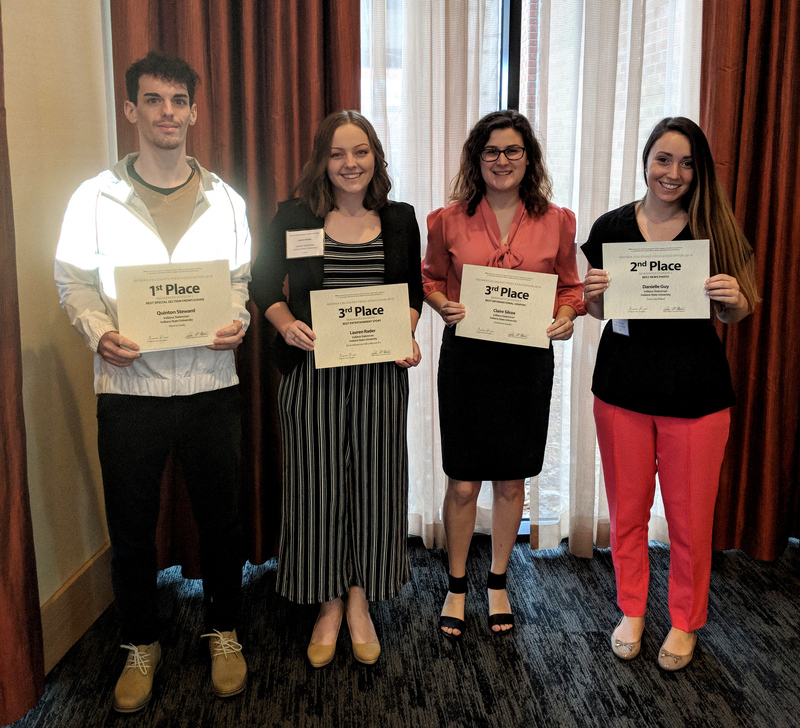 Indiana State University student publications brought home a total 30 awards from the 2019 Indiana Collegiate Press Association Convention held recently in Indianapolis. The Indiana Statesman newspaper's advertising team came in second place for Advertising Publication of the Year behind the Indiana Daily Student, and the Statesman's editorial staff brought home third place for Newspaper of the Year in Division 1 behind the IDS and the Notre Dame Observer. The ad team won 14 awards and the newspaper brought home nine. The Sycamore yearbook won seven awards including first place awards for best execution of theme and best organizations spread. "I'm glad ISU student publications did well in this year's competition," said Martha Milner, director of student publications. "The advertising, newspaper and yearbook categories are incredibly competitive, so these awards carry quite a bit of weight." The ad design team has been competitive at both the state and national levels. In October 2018, designer Becca McGregor, who graduated in May 2018, won a third-place Pinnacle College Media Award from College Media Association. Other top ICPA awards include a first-place newspaper award for best special section front/cover and a first-place advertising award for best ad layout. "I'm proud of our staff and how hard they work, and I'm glad that we have been recognized for that," said Claire Silcox, Indiana Statesman editor-in-chief. "It is awesome to have won third place for Newspaper of the Year." Students who won awards include Chelsea Chapman, Danielle Guy, Lauren Rader, Claire Silcox, Garrett Short with the newspaper staff. In the advertising competition, Austin Gary, Becca McGregor, and Quinton Steward won awards. In the yearbook category, Nayasia Hubbert, Renee Lee, Melanie Stone and Kayli Worthey won awards. "The annual ICPA Convention also gives our students an opportunity to improve their skills and knowledge," Milner said. "The day-long convention included sessions on investigative reporting, tips for handling a first job offer, and newspaper design, among others." In Newspaper Division 1, ISU competes against newspapers at Indiana University, University of Notre Dame, Purdue University, Ball State University and Indiana University Purdue University Indianapolis. Fifteen colleges and universities from throughout Indiana compete in the advertising competition. The yearbook category includes Indiana University, Notre Dame and ISU. ICPA members include colleges and universities throughout the state of Indiana. Each year, they compete in the following categories: newspaper, yearbook, online, news magazine and literary magazine.ICPA was founded in Terre Haute in 1958 at a meeting of journalism honors students held at Indiana State University. The goal of the organization was to provide college students with journalism resources from faculty, professional, and statewide peers. Today, ICPA has about 40 member publications. A board of students and publication advisers oversees the organization. Photo: https://photos.indstate.edu/Other/Media-Services/Submitted-Photos/Staff-Uploads/i-jngCns5/A Quinton Steward, Lauren Rader, Claire Silcox and Danielle Guy display some of the Student Publications awards from the 2019 Indiana Collegiate Press Association Convention held recently in Indianapolis.